Learning how to defend yourself in dangerous situations is important. Every 109 seconds, an American is sexually assaulted . As you can imagine, the vast majority of these victims are female and it’s more likely that your assaulter will be someone you know. I don’t mention these facts to terrify you, but rather to help you be more aware of the truth, regardless of how you identify. And, as a young girl heading off to college, you can imagine that my mother is somewhat anxious about letting her eldest go off on her own. At top of the emotional turmoil parents go through, they also have to come to terms with the fact that they cannot protect their babies from potentially dangerous circumstances. Therefore, my friend and I were signed up for an evening of self-defense classes at Dojo Chattanooga. While I initially rolled my eyes at what I thought was my mother's overreacting, I now see the immense value of the class. Regardless if you ever make it to a self-defense class (something I highly recommend), here are a few lessons I learned from a Self-Defense class. Especially if you are walking by yourself, when it’s dark, or around an unsafe part of town, be aware of your surroundings. If someone were to attack you, where would they come from? Remember when you would play hide-and-seek in elementary school? Hiding in a spot where you can see others, but can remain unseen, was ideal. As the person who was “it,” you had to put yourself in your friends’ shoes. Where would they hide? Likewise, you must put yourself in the assaulter's shoes. Behind walls or corners is a good place for people to hide. To account for this, try walking wide around corners and don’t opt to walk beside a wall. Now this doesn’t mean you should be overly paranoid, but airing on the side of caution won’t hurt either. A ledge under a window or any architecture that juts can be a tool that is often and very easily overlooked. Shove your attacker into a ledge, or if things get really nasty knock their head into the ledge, to give yourself time to get away. On a bad day, you could find yourself pinned to a wall, unable to move. However, YOU can also use the wall as a weapon of self defense. Either use the wall as a bracing force to push off of, or use the wall as something to push your assaulter into before you run away. As a pedestrian, be wary of traffic. However, if you are being assaulted, you can push the assaulter into the road (yes, this sounds macabre, but when your life is in danger, do everything you can to reach safety). Cars symbolize freedom and independence, but they can also cause us to be in troubling situations. Before you get to your car, get your keys out beforehand. Rummaging through your bag/purse for keys leaves you vulnerable for a minute. Additionally, it’s best not to park in lonely parking garages at night. If you need to, ask to walked back to your car. However, make sure you trust the person who is walking you back too. There’s been plenty of research to show that posture not only affects ourselves, but affects how others view us. This is important not only in an important business meetings, but also when it comes to how we carry ourselves daily. Posture provides subtle clues to those watching us. If you walk timidly, are absorbed in your phone, or have earbuds in, you can come off as distracted and an easy target. Instead, walk confidently, with a straight spine, and show the world that you are not someone to be messed with. Although I too have seen boxing movies, that doesn’t mean that either of us are necessarily equipped with the skills to punch our aggressors. In fact, punch with incorrect form may leave us to injure our own selves. Therefore, instead of punch an aggressor, use your elbows, so handily designed to be pointed, to fight off an aggressor. Do take caution in turning your arms down, so that you do not hit your funny bone because that would not be humorous. When in danger, and if you are close to your attacker, a few small kicks to their knee will temporarily impair them and give you enough time to scurry away. However, be wary of becoming off balance while kicking (prevent this by slightly bending your stationary knee and finding your center of balance) or having your leg be caught by your attacker, in which case you will probably fall and inflict more pain to yourself. In the end, avoiding potentially dangerous situations is key. Although you may feel like a pro, as did I, after reading this article, it’s much better to run if you can, rather than testing out your new skills. As much as you want to scream “Fight Me,” fleeing is the safer option. 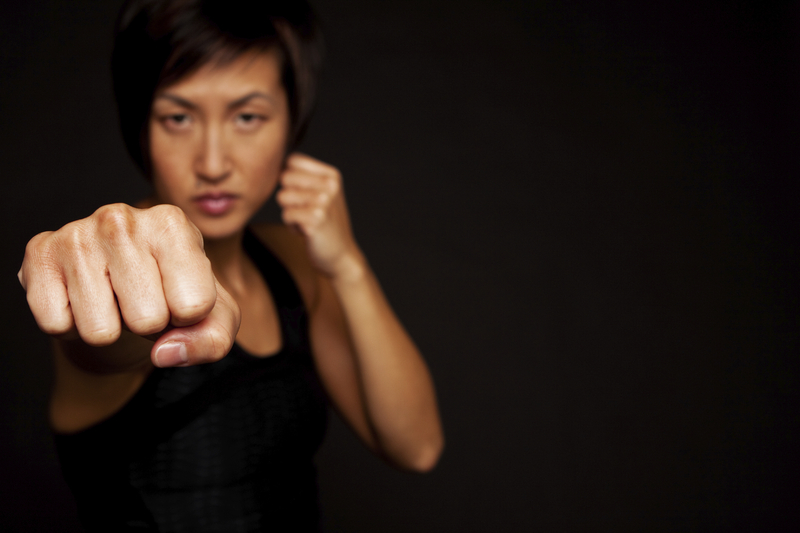 Check out Dojo Chattanooga for more tips and sign up for your very own self-defense lessons. I promise it’s worth every penny!